EyesWeb XMI platform (for eX- tended Multimodal Interaction) as a tool for fast prototyping of multimodal systems, including interconnection of multiple smart devices, e.g., smartphones. 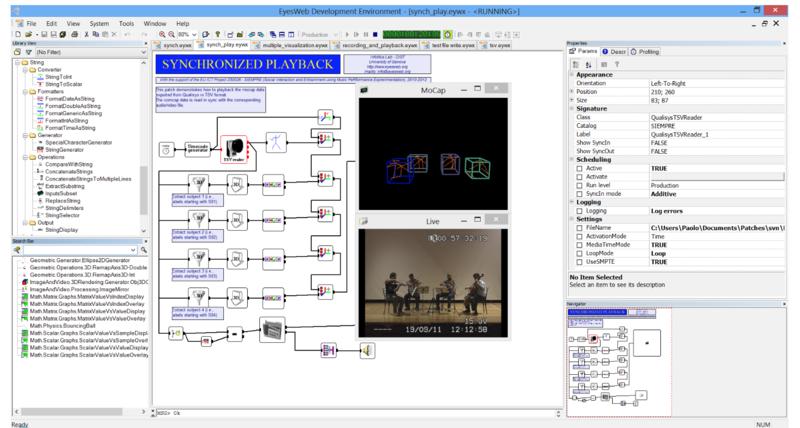 EyesWeb is endowed with a visual programming language enabling users to com- pose modules into applications. Modules are collected in several libraries and include support of many input devices (e.g., video, audio, motion capture, accelerometers, physiological sensors, and so on), output devices (e.g., video, audio, 2D and 3D graphics), and synchronized multimodal data processing. Specific libraries are devoted to real-time analysis of nonverbal expressive motor and social behavior. The EyesWeb platform encompasses further tools such EyesWeb Mobile supporting the development of customized Graphical User Interfaces for specific classes of users.